I would like to apologize in advance for this post, which is very long. I hope to trim down the word count in future trip reports, or perhaps break it up into days, but I am leaving this one as is – in spite of certain warnings I have received about nobody wanting to read long posts. Thank you, and again, I’m sorry. One of the primary reasons The Wandering Moose and I brought this blog back to life was to post trip reports of our vacations. We are big fans of travel, although in our current financial situation that means we are big fans of watching the Travel Channel. I would love to go with T.W. Moose on a historic and cultural tour of northern Europe, or take a multi-month Camera Safari through as much of Africa as possible (See our last post for a more detailed breakdown). However, we are still on a young, married couple’s mac-and-cheese budget, so instead we plan scenic road trips through Central Utah on our way to visit her dad (don’t laugh – it’s a blast and we have done it three years running now). This is why two of our current favorite places are within a reasonable distance to our home in Kearns, Utah; and relatively low-cost. The two destinations in question are Yellowstone National Park and Disneyland. I am not sure which of the two is my very favorite, although I have pondered the question often. At the moment I would say Yellowstone is at the top of my list, although it is close. I cannot even begin to guess for T.W. Moose (her favorite may be Hawaii, actually), but I know she is also a fan of both. We go to Yellowstone for the scenery and unique landscape, of course, but our primary goal is to see the abundant and sometimes elusive wildlife. Part of what makes it such a special destination is the astounding variety it offers. America’s First National Park is a world class destination for geyser gazers, wildlife watchers, hikers, backpackers, and fisherpersons (fisherpeople? ), to name a few. I would guess most people come for the geothermal features, which is a great reason, and one of my favorite things to do as well. We try to go about once a year, and planned a quick trip there with my Mom and Dad for the first weekend in June. All four of us were experienced animal spotters (there is more of a talent to it than one might think), and we had a good general idea of both where we wanted to look, and what time we wanted to be there. The adventure began at my Mom and Dad’s house in the late afternoon of June 5th. It was a Thursday, and we planned to be gone from that evening through to Sunday evening. We picked up T.W. Moose early from work and hit the road just after 5:00 – hoping to get ahead of the worst part of the traffic. There are several ways to drive from Salt Lake City to Yellowstone, although we typically choose either of the two main routes. The first and most common for our family vacations in the modern era is to drive north on I-15 until Idaho Falls, then jump onto US Highway 20 and continue through Island Park until the terminus at West Yellowstone, Montana. It is a very simple and straightforward drive, although not very scenic in the traditional sense until after Ashton, Idaho. It also takes about 6 hours to accomplish, not including various stops. The other sensible route meanders north along the Utah/Wyoming border, cuts through the amazing Star Valley, and drops into the very fashionable Jackson, Wyoming. This is a much more scenic road, particularly after Jackson, as it then passes through Grand Teton National Park on the way to the South Entrance of Yellowstone. When we have used that route in the past we have continued through the park to the West Entrance and West Yellowstone, where we like to stay. This is a 9 to 10 hour drive, not counting stops. We had already decided to take the first route, but with an unorthodox twist. Because of the late hour we would be stopping for the night in Idaho Falls, and then continue up to Yellowstone the next day. We had driven straight through many times before, but this seemed like a nice opportunity to do two-thirds of the drive on the first day and then it would be a short couple of hours to the park in the morning. So, with that itinerary in mind we pointed the hood north to begin fighting our way through the traffic. The Salt Lake/Davis County/Ogden traffic snarl was not quite as bad as I had feared, and before long we were in the clear and headed for the Idaho border. Soon enough we reached Downey, Idaho, and stopped at a family tradition: The Flags West Truck Stop. Downey itself is a quiet little town of 650 people that is several miles off the interstate road. Flags West Truck Stop is on the freeway exit for Downey, and while technically a part of the town, you can’t see any other buildings from there. We like to stop and eat here at least once per Yellowstone vacation. I am not sure how long it has been a tradition for us (I was much more unobservant as a child), but I would hazard a guess that it has been in the 20-25 year range. Flags West has not changed much that I can remember. Like many truck stops it is divided into half a restaurant and half a mini-mart style convenience store. It is set on a rise in the middle of sagebrush flats in southeastern Idaho, which makes it a target destination for miles around. The men’s restrooms (which are generally “clean enough” although have never been “sparkling” when I am there) have condom machines mounted on the wall near the urinals, which were the first of their kind I had ever seen, and much more interesting to me at age 12 than they are now. Directly outside of the restrooms are several shelves of convenient knick-knacks for the truckers and a collection of typical souvenirs for the tourists. The restaurant has about a dozen vinyl-seated booths in the main room and several rows of tables in the banquet area. I should mention by way of explanation that my personal rating system for dining establishments is flawed from the inset. Food and dining experiences are an essential part of my travel and vacationing fun (more than they probably ought to be, if I’m being honest), so the location, the ambiance, the mood, and especially the company play as important parts as the meal itself. I can’t imagine a self-respecting “foodie” even acknowledging this dot on the map in the middle of a desolate stretch of Idaho; but because I am on the way to my favorite vacation destination with my favorite traveling companions (T.W. Moose and my parents), it will get a higher score. With that disclaimer in mind, I would happily award the Flags West Truck Stop Diner 4 out of 5 stars, and it has been that consistently good since I can remember. It is standard greasy-spoon fare, where they serve breakfast any time and it’s often the best choice on the menu. I went with the Super Willie burger, which is a typical excellent diner hamburger turned sublime by the addition of a slice of ham and a fried egg. The egg is an indulgence I learned about while I was in Sweden, and highly recommended to anyone who has never tried it and can get a permission slip from their cardiologist. Other delicacies around our table were chicken fried steak, pancakes, bacon (perfectly cooked, according to T.W. Moose), hash browns, and fantastic, dinner-plate sized fry bread (which we often call “scones” in Utah and Idaho, which is a little odd, because they are very different from proper scones). We arrived in Idaho Falls an hour later, our hearts still palpitating from the cholesterol overload, and settled into our rooms at the Best Western Driftwood. The rooms were not much different from any chain motel, meaning they were clean and pleasant without being spectacular. We had hoped for adjoining rooms, and although they couldn’t accommodate that request, we were told that our rooms were “right across from each other.” We soon discovered this meant they were on opposite sides of the small parking lot, but it was, technically, directly across from each other. My mom and dad’s room smelled strongly of tobacco smoke and someone had left the bathroom heat fan on in ours, but we shrugged off the inconsequential details and settled in for a good night’s sleep. We were getting started early the next day. I slept terribly that night, waking up 30,000 times (an estimate – I didn’t actually count) and finding the bed uncomfortable through the duration. This was not a very good sign, considering I was the designated chauffeur, but we had plenty of drivers in the car in case I began to get drowsy. We pointedly ignored the alarm at 6:15, as well as the snoozes at 6:22 and 6:29. At 6:36 we jumped up and started running around so we could meet Mom and Dad at 6:45. By a miracle of physics I managed to squeeze a shower, dressing and hurried repacking of my bag into nine minutes. T.W. Moose did well with her hair care and morning preparations, and we were only a minute late for the rendezvous. The continental breakfast at the motel was unremarkable (1 ½ stars) save for the extra concentrated apple juice, which I ended up drinking and enjoying in a strange way. It tasted dangerous, somehow. Like when you mix two flavors that don’t quite go together and will probably end up making you sick, but it’s just interesting enough that you keep eating or drinking it anyway. Other people do that, right? It’s not just me? Anyway, I did not get sick, and we soon found ourselves on Highway 20 headed toward Island Park and Yellowstone. The weather began to turn for the worse as we were driving through Ashton and up onto the caldera. We had been watching the forecasts and were prepared for rain and snow showers. 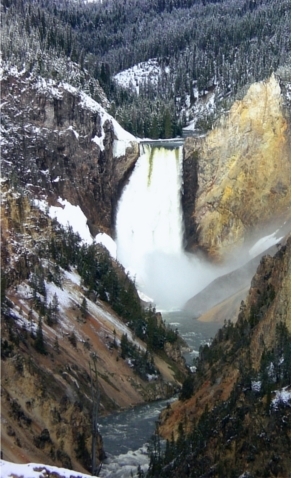 Although it was June, Yellowstone Park is high mountain country and it can snow any month of the year there. We figured we may see a few flakes and a few raindrops, but nothing significant; and it could even improve the animal spotting. It was quite cold for that time of the year – about 40 degrees Fahrenheit – when we made it to West Yellowstone. 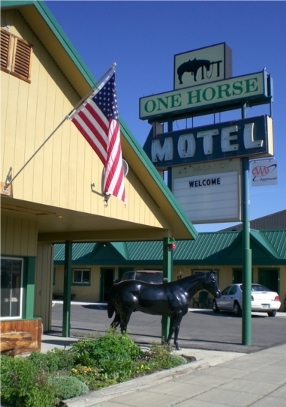 Our favorite place to stay in West Yellowstone is the One Horse Motel, which I have mentioned before on this blog. Nick and Becky are the proprietors, and it is located in the middle of the town, across from the city park. It is a fairly basic establishment – there is no swimming pool or espresso bar for those who like the extras. But the rooms are always spotless, with comfortable beds and a ton of charm. I am not sure whether this next tidbit indicates how great the One Horse is or how goofy we are, but we like it so much that T.W. Moose and I have Nick and Becky on our Christmas card list. We dropped off a few bags and headed for the West Entrance of Yellowstone, which is about three blocks away from the One Horse. For those who have never been, Yellowstone is a very big place. It comprises 3,472 square miles (or 2,219,789 acres, which I wrote here because I couldn’t decide which one sounded more impressive) with just over 300 miles of paved roads. The roads make a large figure-eight, providing access to the famous thermal features, canyons, waterfalls, and vistas. Five additional roads come off either the Upper Loop or the Lower Loop to meet five separate entrances into the park. We rarely venture too far away from these main areas, although T.W. Moose and I have hiked to several different lakes and waterfalls in past trips. For this one, though, we were looking mostly for wildlife, and would be staying on the main paths. High water was our first impression of the park. The Madison River meadows were flooded, so the bison and elk we often see there were either standing on high spots – islands of grass in the water – or were up to their knees as they browsed for food. Dad spotted a bald eagle high in a tree along the Madison, which we watched at a respectful distance for a few minutes and imagined it was studying the river for morning breakfast. I took it as a good omen to start the day. We decided to visit the more popular Lower Loop first, which would include a stop to pay our respects to the most famous geyser in the world: Old Faithful. The road between Madison Junction and Old Faithful has the largest concentrations of geyser basins in the park, and although we did not stop at any of them during this particular trip, we have often in the past. Instead we continued to the Old Faithful junction and drove around until we found the Lodge, where we went inside to watch the namesake erupt. The Old Faithful complex is a confusing cluster of buildings. There are several different stores, along with a lodge, a ranger station, and an inn, which are all significant places, and each of those has a store, as well (it is the ranger station, I believe, that has recently been torn down and is being rebuilt). There is a snow inn for winter visitors, complete with its own store and cafeteria, but is also open year-round. In fact, when we did the same basic trip last year with T.W. Moose’s mom and stepdad, we almost literally stumbled into yet another store that I had never even seen before, but had been there for decades. I have been to Old Faithful many times in my life, but I still have an incomplete picture of where all the pieces are in relation to each other. Something about the place simply skews my sense of spatial reasoning. The same phenomenon is also true for me with the city of Las Vegas, for reasons I don’t understand. After wandering around the store in the Old Faithful Lodge we got back on the road, continuing counter-clockwise on the Lower Loop. There was still a great deal of snow on the side hills, and we could see storm clouds lurking in the distance, but we knew it rains nearly every afternoon in Yellowstone anyway, even in the dry summer months. A little precipitation was expected. The snow did give us something to look at, though, along the stretch of road that goes from Old Faithful to Fishing Bridge. We rarely, if ever, see wildlife along there, and the scenery only changes when we come down from the Continental Divide and drive along the enormous Yellowstone Lake. The lake is impressive, of course, but after the first few minutes of shoreline the passengers in the vehicle are finally lulled to sleep by the seemingly repetitive vistas, beautiful though they may be, and the driver is left to contemplate the road in silence. We did break up the Lake stretch of road by stopping for a picnic lunch in a turnout. We ate in the car because of high, cold winds that none of us wanted to endure. We had forgotten to bring a loaf of bread for our turkey or bologna sandwiches, but we found one in the Grant Village store, which had a modest selection of food items. The bread was just about at the end of its usable shelf-life, but the travel and the clean mountain air had given us all an appetite (as Cervantes writes in Don Quixote: “Hunger is the best sauce in the world.”). I am not sure how to rate our picnic lunch, but I will go with 2 ½ stars because it was in the park, although all we really could see were a lot of lodgepole pine trees. It was a welcome meal, at any rate. Our next stop after lunch was the Fishing Bridge General Store, which is one of our favorite stores in the park. If it has not become obvious from the narrative, we like to stop in these places and look around. I don’t often buy things, but I do enjoy browsing, and T.W. Moose shares my interest. She sometimes finds little items to add to her collections (namely keychains, decks of cards, and bags; and we both collect pins), but for the most part, it’s the fun of looking that draws us to the stores. While in the Fishing Bridge store we noticed that the snow had begun in earnest, and cars coming from both the East Entrance Road and around the Lower Loop had snow packed grills. None of us had ever been in Yellowstone during the winter, and while T.W. Moose and I had been in snow once, it hadn’t been much more than a few modest flakes. 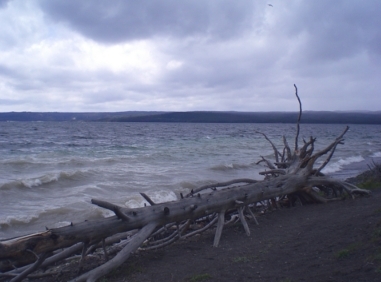 We finished our shopping and headed out, first down the East Entrance road as far as Mary Bay (a beautiful bay of Yellowstone Lake where Mom and Dad had seen a grizzly bear before), then doubling back to continue along the Lower Loop road. We were still unconcerned about the weather. Soon enough we began approaching the Hayden Valley, which is along much of the eastern quarter of the Lower Loop road. There had been no letup to the snow, and in fact it seemed we were moving deeper into the storm. Hayden Valley is a large, open grassland surrounding the Yellowstone River where bison like to congregate. It is also a haven for the park’s other animals, and over the years we have seen elk, moose, coyotes, and black bears there – among others. We often see the bison right on the roadway, and with a car full of capable spotters it was very likely we would see something else, as well. As it turned out, we saw snow. With no trees to break up the wind it began piling snow on the road and became a near-whiteout through the Hayden Valley. We did pull into the Mud Volcano area (which has some interesting thermal features) after noticing a few bison covered in snow and we wanted to take a picture of them. The park was quite busy that day, and in spite of the serious snow there was a bus full of tourists looking at the massive animals, as well. One of the tourists had been coming down a boardwalk stairway from looking at other thermal features when a bison stepped right across the walk, not 20 feet in front of him. 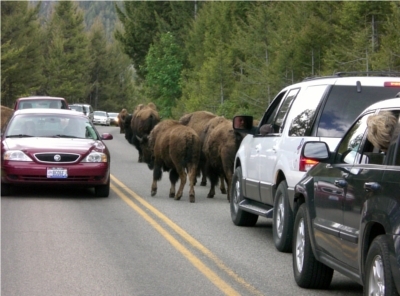 It was a tense situation, in spite of the seeming placidity of the bison. After a few moments the animal turned and took a few running steps toward the man, who scrambled off the boardwalk and tried to hide behind a small sapling. The bison, satisfied or amused by the display, turned back and started wandering to where his fellows stood. The tourist quickly made his way back to the bus (we took wagers on whether he had to change his pants) and we all continued down the road. The snow was frustrating on several levels as we carefully paralleled the big river. First, it made the roads quite treacherous, regardless of how fast we were going. We slipped quite a bit in the corners in spite of the all-wheel drive system on our Hyundai Santa Fe. Second, and somewhat less critical, we couldn’t see the animals. Since the bald eagle on the Madison River that morning we really had not spotted much of anything out of the ordinary except the snow. Not that I wish to take the endangered bison for granted, but the casual visitor sees a lot of them. We wanted to see a greater variety. After a long while we made it out of the Hayden Valley and into some trees, where the shelter made for easier driving. Our next stop was the Canyon area, where we wanted to take Mom and Dad through the new Canyon Visitor Education Center, which has an incredible interactive map (I have a minor obsession with maps) and very interesting displays. Upon arriving, however, we found that the storm had knocked out most of their power. They had enough to run the heating, the bathrooms, and to nobody’s surprise, the store. The rest of the museum was dark, and they had no idea when they would be able to get it running. My dad, who is a Master Electrician (that’s his actual degree, not just a cool-sounding nickname), told us that they had probably lost a phase (and we nodded, even though we only had the vaguest idea what that meant) and so we shouldn’t expect them to have it running any time soon. Disappointed, we climbed back into the car and continued down the road. 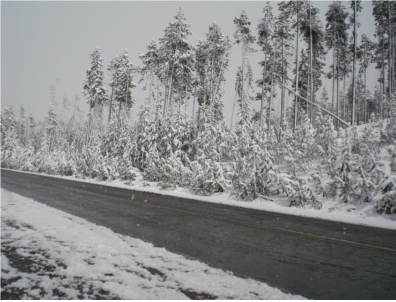 We drove across a high, snowy pass in the middle of the figure-eight road, dropping down into lower elevations where the snow had been mostly rain. Better still, the sun was peeking out from the storm clouds by then, and we suddenly found ourselves reinvigorated. Rather than continuing out of the park, as we had thought, we decided to drive up the west quarter of the Upper Loop, which led from Norris Junction to Mammoth. We always see interesting animals along that stretch, as it has prominent high mountain meadows and abundant water. We drove all the way up to the highest meadows before the road drops into Mammoth Hot Springs, and saw a few more elk, but nothing like we were hoping. There is a stretch of road along that part of the park full of beaver dams and willows, which is considered ideal habitat for moose. As I have mentioned before in this blog, T.W. Moose’s favorite animal is (surprise!) the noble moose, so finding one is a significant goal for us. We like to keep a list of the animals we see, and for the past few years, the moose has been the most difficult to add to the list. With that goal in mind we trolled along that stretch, focused and intent on finding something. We said things like “you just think you would see a moose out there” every few minutes. However, it just was not going to happen that day. A bit disappointed, we turned down the western curve of the Lower Loop until we reached the Madison Junction and drove out of the park. It would have been wrong to call it a bad day, but it did not live up to our expectations. We all had experienced something new in the snow storm, and that would make for a good story later, but we were still a bit wound up by the white-knuckle drive. Actually, to be fair, perhaps it was only me that was still wound-up from that part of the drive. Regardless, we were all tired and ready to be done with our first day. As we drove into West Yellowstone I had a dull headache, I was tired, and all I wanted to do was crawl into bed. We arrived back at the One Horse Motel and went to our separate rooms (right next to each other, unlike at the Driftwood) to freshen up for dinner. My freshening was accomplished by flopping onto the bed and making comfortable grunting noises every few seconds. T.W. Moose went into the bathroom and closed the door, I think in part because my noises were irritating her. About 15 minutes later we met to go eat dinner at another of our favorite places in West Yellowstone. Three Bear Restaurant (or “The Three Bears,” as we like to call it) is another common stop during Yellowstone Park trips for the Nelson clan, and may very well have saved the vacation for me that evening. That is my opinion in part because we had great food and refreshing caffeinated beverages, but mostly because I felt so good after the meal was done and had some fuel in my furnace again. I had a fantastic open-faced roast beef sandwich and T.W. Moose had a french dip sandwich, which each earned an easy 4 stars from both of us. We cruised back to the One Horse feeling contented and even optimistic about the next day. I did not sleep well again for half of that night, despite having been up early and driving all day, which is tiring in a way (not tiring like digging ditches all day, but it takes a toll). Around 2:00 AM I got out of bed to use the bathroom and in the course of stumbling back I saw my socks on the floor near my shoes. Still in that unthinking half-sleep daze, and not entirely sure why, I put my socks back on and crawled into bed. The next thing I knew it was morning, the alarm was ringing, and I had enjoyed a sound, refreshing rest. I was so excited for the discovery that I told the story three or four times that day. Breakfast that morning was McDonald’s (2 ½ stars – I am a fan of McBreakfast), which we ate on the road as we began our final day in the park. We saw the bald eagle again, in the exact same tree on the Madison River, and T.W. Moose made a great spot of a different, juvenile bald eagle in a tree very soon after. We started to feel a different energy about the day. We decided to try the Canyon Visitor Education Center again, but the power was still off when we got there. So we detoured to nearby Artist’s Point where we could view the iconic Lower Falls of the Yellowstone River. The road from Canyon to Tower Falls over Dunraven Pass was also closed because of snow, so we drove back to Norris Junction and then up the west quarter of the Upper Loop to Mammoth. Although we had been disappointed along this stretch of road the day before, we soon came across a big “animal traffic jam.” It ended up being for a grizzly bear on a distant slope, and T.W. Moose and Dad saw a brief glimpse of it before it disappeared into a thick stand of trees. Sighting one of the rare or high-profile animals in Yellowstone almost always creates these animal traffic jams, so it is always a bit thrilling to come around a corner and see a cluster of cars and people out taking pictures. The park provides obvious and stern warnings about approaching wild animals in the park, but the excitement of seeing something like a bear always creates genuine idiots out of some people. 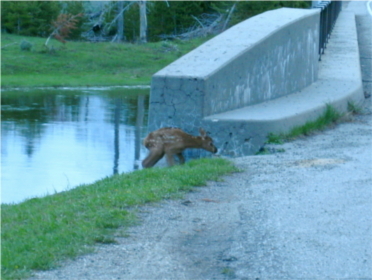 I mention this because we saw our first elk calf of the trip once we got to Mammoth Hot Springs. We were watching from the car at a respectful distance when an older man with a point-and-shoot camera traipsed up close enough that he managed to block our view and scare the elk cow and calf away. We rolled our eyes and muttered curses, and then continued on. From Mammoth we took the spur up to the North Entrance so we could see the Roosevelt Arch. We took a few pictures of the arch with dark storm clouds behind it, which made for great photos, but also signaled the beginning of more bad weather. We never quite saw anything to match the intensity of the snow in Hayden Valley the day before, but we chased storms for most of the day. We jumped in the car and headed back to Mammoth, passing small groups of pronghorns on the road. Along the northern part of the Upper Loop we found our next animal traffic jam. Our pattern for evaluating these traffic jams is always the same (as I suspect it is for many people): as soon as we notice the clustered cars, we start looking for the cause so we can decide whether we want to stop or not. However, before we saw the animals we saw a park ranger monitoring the situation, which is almost always a good sign for animal watchers. We found a spot to pull over the car and began looking. Right away we all saw a coyote running around in the bottom of a little depression, which was fun to see, but hardly worth the major jam and the park ranger. While we were puzzling at this, Mom cried out: “There are babies!” and we started spotting little, wriggling balls of fluff. The coyote pups came tearing across the depression toward the adult coyote we had seen at first, followed by another adult coyote that had been with the pups. The second adult approached the first adult in a very submissive posture, low on its stomach and ears back. The first coyote sniffed at the second one, and must have given some sign of acceptance because the second coyote suddenly leaped up and began prancing around with the pups. At once, all the coyotes put their heads back and began to howl, as if they were all so happy to see each other that they couldn’t help themselves. It was one of the most amazing, even moving things I have ever seen during a trip to Yellowstone. Even now, as I’m writing this a month after we returned, I can remember the chills I got listening to the chorus of coyotes. We moved on shortly after so others could take our place and share the same experiences. Not long we arrived at Roosevelt Junction and continued on to Tower Falls. T.W. Moose and I walked down to see the eponymous falls, which is a short stroll of 150 yards. Tower Falls was beautiful, as always, and as full of water as I had ever seen it. While at the overlook we saw a bighorn sheep with a lamb negotiating a thin trail on a hillside not far away. The second day was already much better than the first. From Tower we went back to Roosevelt Junction and took the spur road that leads out to the Northeast Entrance. Not long after we found another animal jam, this time for another grizzly bear. We pulled off the road where we could still have a good viewing angle of the bear and made leftover sandwiches for lunch (identical 2 ½ stars from the day before). We could tell the grizzly was very large even though he had to be nearly 600 yards away. He (big, awesome bears are always “he” in my book – unless they have cubs, of course) was busy tearing up the ground for grubs, and ambling along the side of a hill. We watched as we finished off the bologna and then moved on, soon entering the Lamar Valley, which was our primary reason for going this way. The Lamar Valley may be the best place in the entire park to see wildlife, although the animals are often distant and can require patience and powerful binoculars to see. We have never been there that we failed to see wildlife, even if simply the ubiquitous bison or elk. We often stop to scan the hills across the Lamar River for bears and wolves, which can often be seen in the valley. As Dad and I glassed the hillside it seemed like every place we would stop we saw more animals. They were nearly always elk or bison, but the sheer volume of animals was astounding. In the bottom of the valley we could see a bison carcass, and a helpful fellow animal watcher told us wolves had been before the most recent storm moved in. In their stead we could see jet black ravens hopping around and picking the bones clean. A few bald eagles had also descended to pick with the ravens, which was interesting to see. On the other end of the Lamar Valley we found another animal jam. We were told that a pack of wolves had crossed the road minutes before and were busy settling themselves in the trees on the other side. We watched for a minute and I even managed to spot a quick, dark shape as it darted into the undergrowth. Right after that we heard the wolves barking and imagined they were playing with their pups, as they coyotes had been earlier. The rest of the Lamar Valley was uneventful, although we were on high alert after all of the previous encounters. We made it back to Roosevelt, where we went up to the lodge for dinner. The Roosevelt Lodge was built a century ago when Theodore Roosevelt came to Yellowstone for one of his many trips here. It has been converted into a restaurant and bar, and it is one of our favorite places to eat because of the setting and the ambience, and because the food is almost always good. I had a 4 star plate of barbecued beef brisket, while others at our table enjoyed fried chicken and pasta alfredo. We decided to start driving out of the park from there, as it would take us several hours to get from Roosevelt to the West Entrance. Near Mammoth we came across our next animal jam, although this one was moving slowly down the road. Bison will sometimes mosey down the roads, unconcerned about the impatient drivers around them, so we began guessing that was the case. At last, we discovered it had been a black bear walking parallel with the road, and the lead car was idling along, keeping time with the bear. This meant that one car got a great, long look at the bear walking, but the 50 or 60 cars behind them – each of whom would have liked to see the bear – missed it entirely. The selfishness and disregard of the people in the lead car bothered me for hours afterward. Not long afterward we came upon yet another animal jam in the ideal moose habitat area described earlier. This was the biggest jam we had seen yet, and we felt certain this had to be the long-awaited moose. We found a half of a spot to park and T.W. Moose and Dad jumped out to see what was going on. Mom and I stayed with the car, mostly so we could move it if the occasion required. Whatever was there was not immediately obvious, and we kept watching with great interest from the car. As it turns out, all the excitement was over a pair of beavers… 50 pound rodents that chew down trees. Granted, most of the people congregated for the same reasons we did: we thought there would be a big, impressive animal like a moose. But instead a nature photographer had spotted a pair of beavers and hauled his humongous camera out to start snapping. Passersby saw the gear, assumed the best, and quickly followed suit. Now, beavers are also very reticent animals and rarely seen, so to animal aficionados like we had in our car it was exciting to see them. I’m sure plenty of those who stopped were just as interested, as well. But it was a bit anti-climactic. Dusk was just beginning to dim the sky as we passed by Norris. Moose country had come and gone without a sighting, but we were still looking. Just before the junction we came upon what would be our last animal jam of the trip, and in some ways the most unexpected. It was a lone wolf trotting along the road looking for its dinner. Becoming a true lone wolf (if that is what this was) is a bad situation for these very social animals. As is the case when wolves have been drummed out of their packs, it was scrawny and probably very old for a wolf: it looked to be in pretty poor shape. The wolf’s coat was very dark, black for the most part, and seemed to be living its miserable pack-less existence more like a scavenging coyote than a proper, hunting wolf. The wolf drew parallel with our car – not more than 10 yards away from us. We took a few pictures and moved on, not wanting to make the same mistake as we had seen before. Further down the road between Madison Junction and West Yellowstone we came across another cow and calf elk. We guessed the calf could have been born that same day, as it was easily the smallest we had seen and it followed its mother on shaky, spindly legs. 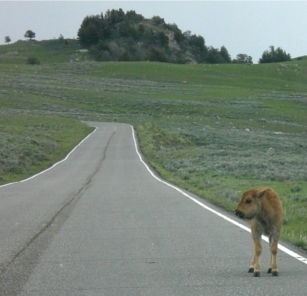 At one point the calf, seized by a sudden curiosity, moved up a hill toward the road as if it was going to try crossing it. Before any of us could get too nervous about that prospect its mother gave a low grunt and it went stumbling back to the protection of her legs. On the last stretch of road during our last evening in the park we were still holding out hope of the elusive moose, but it was not to be for this trip. We did see one last coyote, which could very well have just popped out of the trees just to bid us farewell, considering how quickly it came and left. It was a fitting way to end a very short and eventful weekend in Yellowstone. My mom calls it “Commando Style” vacationing, which is a perfect way to describe our efforts to cram maximum fun in a minimum of time. And yes, T.W. Moose and I both giggle to ourselves about “going commando” while on vacation whenever she says it. But it’s far too clever a comment on my mom’s part for us to say anything about that. Back in West Yellowstone I indulged in another personal tradition: Wild West Pizzeria. It is the best pizza I have eaten in West Yellowstone (and there are more choices than you may guess), and could very well be the best pizza I have eaten, ever. I know the location has a lot to do with my enjoyment of their pizza: I am in our favorite One Horse Motel after a day spent in my favorite vacation destination. But I have also eaten it cold once we are back home, and enjoyed it every bit as much. As unexpected as this may sound, one of the world’s best pizza joints (4 ½ stars) is tucked into a small building on a back corner of West Yellowstone, Montana. I don’t have much to write about this day. We checked out of the hotel, did a little shopping, and drove home. We did have breakfast at The Outpost Restaurant (2 ½ stars), who did a decent job of biscuits and gravy (T.W. Moose says her French Toast and Bacon were 4 stars, however). The rest of the day was spent either in the car or at Flags West again (4 stars), where we made a rare double appearance. After that it was just a few short hours until we started seeing familiar outposts of the Wasatch Front, and then we were home. It was a very unusual vacation in many ways. We had a unique first day in the park followed by an amazing second day, and in spite of the white-knuckle driving and the very few animal sightings, I expect the four of us will remember this trip for years to come. The variety of experiences is certainly one thing that a vacation to Yellowstone has over many other destinations. Each trip is different, even if only in small ways. The thrill moments are not guaranteed, and will almost always surprise you when they do come. That is why I am proud to declare, once and for all, that Yellowstone National Park is my favorite vacation destination in the world. Well, at least until September when we go down to Disneyland. I will keep you posted. Those photos are amazing! Sounds like a great trip! Thanks, Tom! We had a great time and are already looking forward to our next trip back. Ya know, I’m not soo old I don’t know what “going commando” means. Maybe that’s what I meant on the trip…. I should have guessed you would know that, and I have to say it makes your “commando style” vacation comments all the more entertaining and clever, in my opinion. Er, would you believe that I did it in secret, when you weren’t looking? Trust me, he is TOTALLY cool with me eating the Super Willie Burger.